a delicious giveaway from gastronomy by joy! 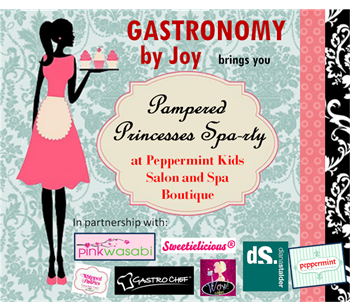 Apart from the spa-rty, the 5 lucky winners will also get to bring home other delicious treat including a free baking course from Sweetielicious Home Baked Goodies which will be raffled on the day of the event. I do not know about you, but a baking class is something that I would love to experience, too! This entry was posted in announcement and tagged giveaways on 18.October.2013 by admin. Here is another exciting giveaway for you to join! Romania and Missions, Crafty Zoo with Monkeys, Simply Sherryl and Barbara’s Beat. This entry was posted in announcement and tagged giveaways on 3.October.2013 by admin.